Take a pint of cream & boyle in it 2 rase of ginger, a little sugar & let it cool. Put to it 6 eggs, 2 whites, half a spoonfulls of flower. Then have some sippits of bread toasted & some raisons, some lumps of marrow, & butter ye bottom of your dish very well & lay a lairer of sippits & then a layer of raisins & then 6 spoonsfulls of cream, than a layer of marrow, then raisins & sippits again & cream, & so fill yr dish. Put a lid of puff paste at top. 3 qrs of an hour bakes it. 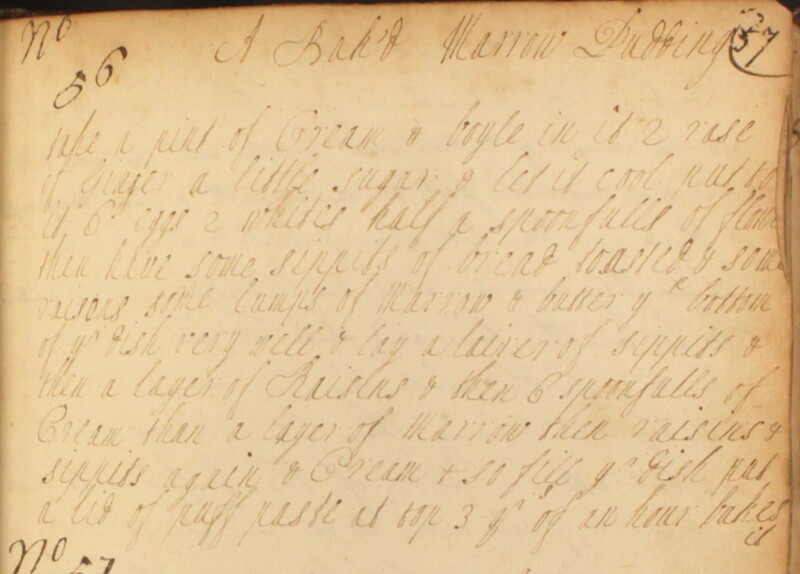 This entry was posted in 18th century recipes, Puddings, cakes, biscuits (C18th) and tagged 18th century cookery, bone marrow, bread, cream, puddings, raisins. Bookmark the permalink. try the medieval Lombardy Custard that also uses bone marrow and makes a great alternative to Christmas Pud. Hi Maya, thanks so much for this suggestions – we’ve found this recipe for Lombardy Custard on CooksInfo.com: http://www.cooksinfo.com/lombardy-custard. It looks intriguing! Are they really speaking of bone marrow here,not squash? Hi Deirdra, thanks for your comment! Pretty amazing, thanks so much great post!